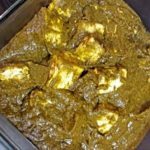 Palak Paneer - Indian cottage cheese in smooth creamy delicious spinach gravy, is a delicious Indian dish, favorite across north India. 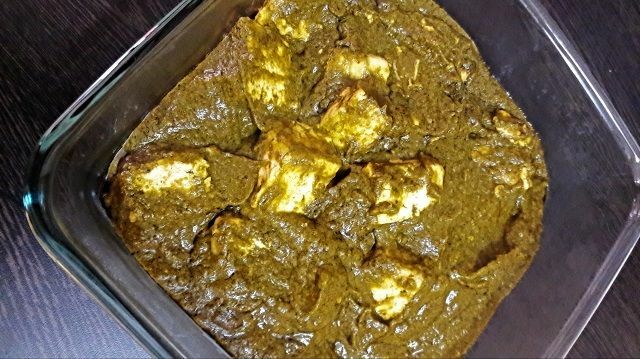 A healthy green colored cottage cheese curry recipe served mainly with Indian breads like roti, paratha, nan and missi roti. Remove spinach leaves from stem (tender stems are fine but if stems are stringy, then discard those stems) and wash leaves very well in running water. Heat a heavy bottomed wok; add 1 tablespoon of oil and butter to it and lightly to fry the cottage cheese cubes till brown and keep it aside. Take 3 cups of water in a pan and add 1/4 teaspoon of salt to it, when it starts to boil, then add spinach. Let it sit in water for 1 minute. After 1 minute switch off the stove and drain the hot water. Now, remove the spinach from pan and immediately add to a bowl containing ice cold water (this method help in preserving natural green color of spinach) and allow spinach leaves to cool down. Now, drain the ice cold water from spinach leaves. Blend the spinach in a blender along with chopped ginger, garlic and green chilies to make a thick spinach paste and keep the spinach puree aside. Heat a heavy bottomed wok in low flame then add oil or butter to it, when the oil gets hot add cumin seed. When a cumin seed starts to crackle add bay leaves, then add chopped onion and saute till the onions become golden. Then add chopped garlic cloves and again saute till raw aroma of garlic goes away. Now, add the chopped tomato and let it cook for 5-6 minute on medium heat stirring the mixture till tomatoes gets soften. Once the tomatoes get softened and you see fat getting released from the mixture add turmeric powder, red chili powder, coriander powder and asafoetida powder stir very well. Now, add spinach paste mix well, add 1/2 cup of water stirring the mixture and let it simmer further for another 5 minute or more till spinach gets cooked season with salt, the puree will also get thicken by now. Add 1 pinch of sugar to remove bitter taste of spinach. Stir and add garam masala powder. Stir again then add the fried pieces of cottage cheese and mix it well. Cover and cook on low flame for 6-7 minute. When you will see the cottage cheese cubes became soft and succulent. Cook for about 1 more minute. Take it out in a serving bowl and garnish with fresh cream. Serve hot with chapati, paratha, nan or steamed rice. Liked your suggestion to add sugar to remove bitterness of spinach.